"Very Informative,Easy to follow & understand trainer very easy to speak to & ask questions & answers were very clear & easy to understand." "I now have confidence to use this programme. Simon was excellent, nothing was too much trouble. Excellent tutor, thank you!" 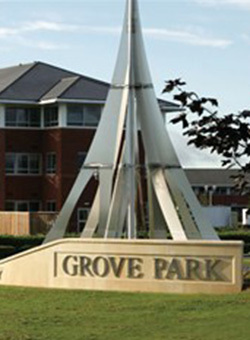 "Very happy with the topics covered and the quality of the tuition"
"Really great, got a lot out of todays training session" "Very well received, excellent"
The centre at Grove Park is conveniently located immediately off the junction with the M1 and M69 Motorways. The central location provides an ideal base for not just Leicester companies but also national businesses looking for an accessible UK base. Leicester City Centre is a 10 minute drive and the motorways are less than 5 minutes away. A great venue for your Beginners Microsoft Excel 2013 Training Course. Alternatively if you live in and around Leicester and wish to have your training on-site the we can provide all the equipment, included laptops & projector, required. All we ask is that you provide a little space for the trainer to set up. There are many other computer training courses in Leicester. Please take the time to look through them. Cleaner, sleeker fresher. That is what some are saying about Excel 2013. An ability to add on different tools will give you loads of time saving options. This beginners Excel training course will not only give you a brief orientation into Excel 2013 but will familiarise you with general basic concepts such as Excel formulas, Absolute References, Auto-fill and operator preference. Microsoft has continued the use of the ribbon which you can use to enter in formulas. Thus making it easier to multiply and divide, add or subtract. Also armed with flash fill makes Excel 2013 an powerful addition to your business. Learning how to use it properly is a no-brainer. This is a course for the absolute beginner so no previous knowledge is required. Although having a basic knowledge of file management and general Windows or Mac operation is necessary. Absolute reference, dollars signs or fixing a formula, formulas or formulae whichever takes your fancy. You know sometimes I see people do the most interesting things to get around a problem that can be sorted with absolute references. What do I mean? Well say for instance you have a list of products, and you've calculated the revenue made on each but now you want to work out how much each product sale is worth to your company, as a percentage. First create your spreadsheet and create your calculations. Then add an extra column at the top that has Percentage of total as a heading. Click in the cell below and presuming your revenue for each product are in cells D2:D20 and your total in cell D21 then the formula would be: =D2/$D$21 you can either multiply the sum by 100 to get a percentage or format the cell as a percentage. Afterwards you can autofill the formula down to apply it to the other cells.